FRANKFORT, Ky. - A former security guard accused of looking the other way as thieves spirited away thousands of dollars' worth of whiskey from a Kentucky distillery was indicted Tuesday, as prosecutors widened their net on what they say was a longtime theft ring. A grand jury in Franklin County indicted 34-year-old Leslie Wright on a charge of complicity to receiving stolen property over $10,000. Assistant prosecutor Zachary M. Becker said Wright was paid for doing nothing as the thieves stole barrels filled with bourbon from the Buffalo Trace distillery in Kentucky's capital city. Becker said Wright was paid a total of $800, and that she turned a "blind eye" on two occasions when a total of 11 barrels were stolen. Becker also said Wright is cooperating with authorities. It was not immediately clear if she has an attorney. It's the latest indictment as Kentucky authorities crack down on what they described as a theft ring in the heart of the state's renowned bourbon country. Prosecutors say the scheme - led by rogue distillery workers - lasted for years. Franklin County Sheriff Pat Melton has estimated the recovered whiskey alone is worth at least $100,000. Nine people were indicted earlier this year as part of the alleged theft ring. Two of the indicted defendants pleaded guilty recently and agreed to cooperate with prosecutors. The earlier indictments linked the theft of barrels of Wild Turkey whiskey earlier this year and the disappearance of Pappy Van Winkle bourbon dating back to 2008 or 2009, authorities said. Pappy Van Winkle is made at the Buffalo Trace Distillery, using a family recipe that traces back to the 1800s. 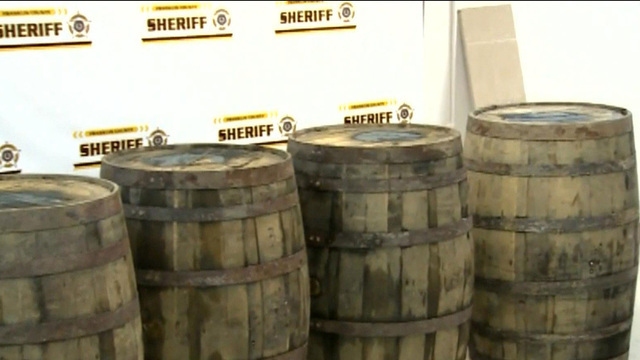 The investigation gained steam this year when authorities found several bourbon barrels behind a shed in Franklin County. The labeling on each barrel had been obscured. Wild Turkey's owner, Italian-based Gruppo Campari, had said there were no signs anyone broke into the warehouse where those barrels were stolen. The barrels were found behind the home of longtime Buffalo Trace employee Gilbert Thomas Curtsinger, the accused ringleader behind the thefts. Kentucky is home to about 95 percent of the world's bourbon production, according to the Kentucky Distillers' Association.